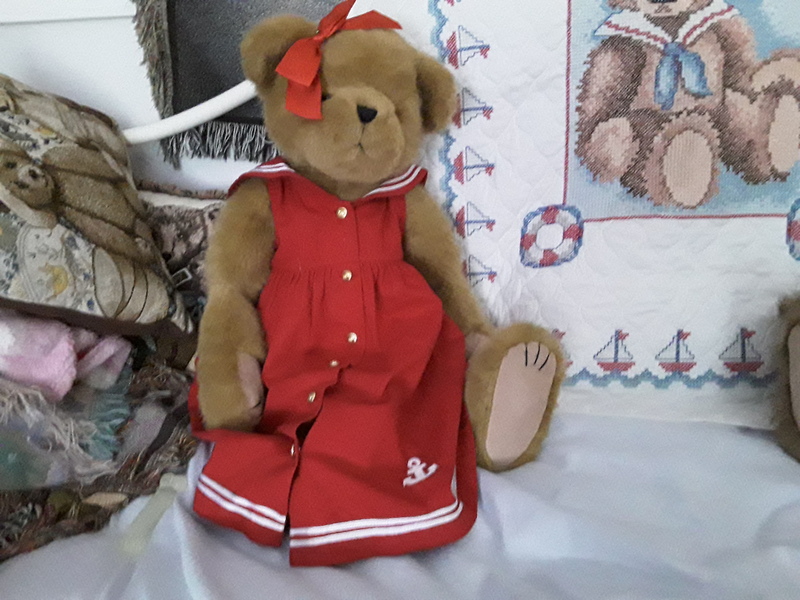 Hey everybody-did i ever tell ya’ll that i am a happy bear? Mama takes a turn for the better! Mama feels somewhat better this week not great but better. One of her meds which make her very ill is on again off again at 2 week intervals and this week she is off . 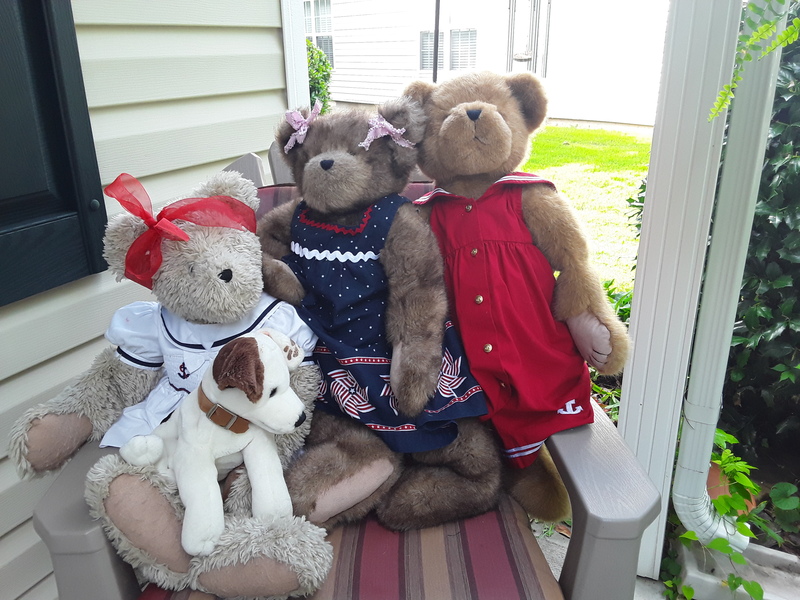 So we are planning to fly up to the pittsburgh pa area to be with aunt geri for her birthday. Since we fly standby we will make the final decision on whether to go or not on tuesday. 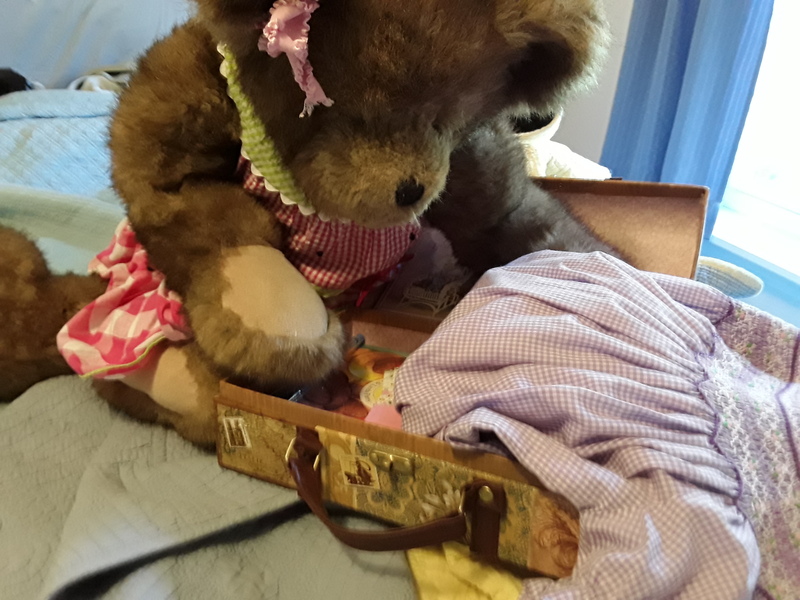 However i am an extremely optimistic teddy bear and i have started to pack my bag. Literally all of mamas people live north of the mason dixon line so mama gets cheated out of birthday cake very many times during the year. It is v ery sad. Mama had some problems with what she calls “medical related real life issues”. 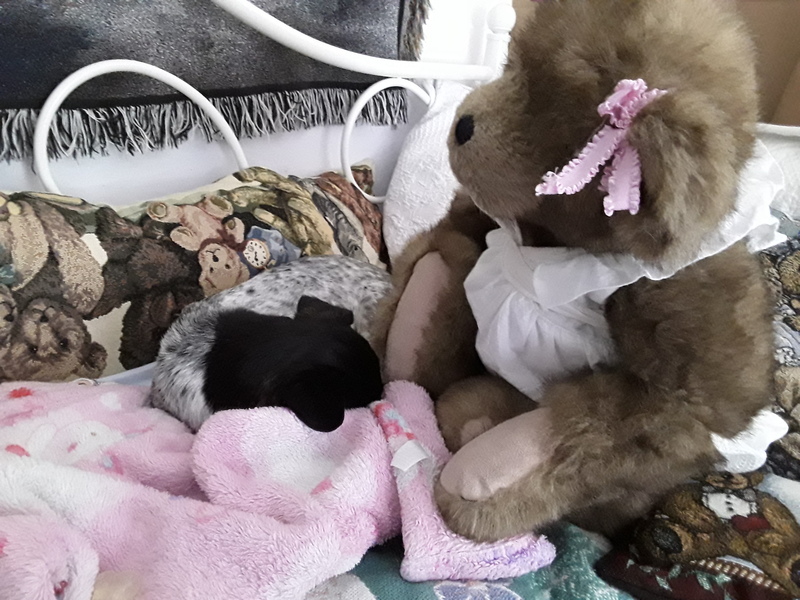 When this happens i do not go online often , preferring to concentrate on comforting and cheering up mama, which is after all my main job in this household. 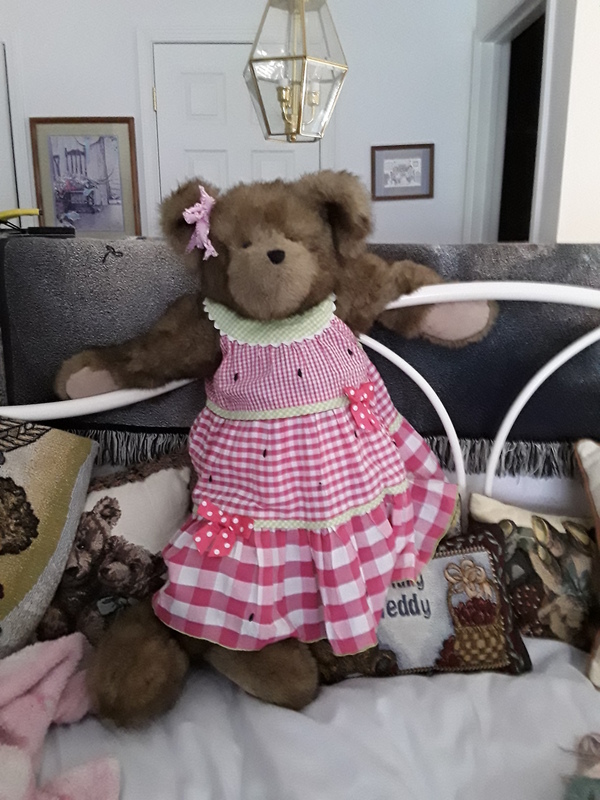 Fortunately mama had already sewn my july dress weeks ago as she had hoped to join aunt geri and her teddy honeybear in pennsylvsnia. In jluy and wanted to have me dress for the holiday. Well it does not look like mama is going to visit aunt geri this july. In the whole 68 years of her and aunt geri’s life they have only been apart in july 2 times. They are twins. 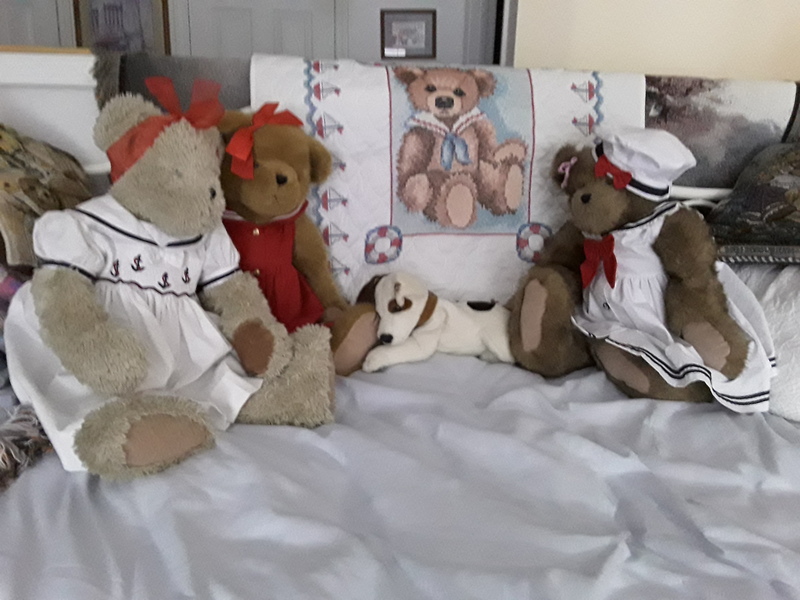 They are very disaponted but the wor ld will go on spinning regardless and both aunt geri and mama realize that it is not the worse thing to happen. Mama and i fly standby as mama’s dear husband works for the worlds larrgest airline and last minute arrangements could be made to fly north if mama suddenly “takes a turn for the better”. During thunder storms and still to come fireworks. And speaking of fireworks they are very legal in sc and are used constantly here all year round for parties and picnics. I am helping mama set up a holiday scene for her hitty dolls and they will have firewirks. 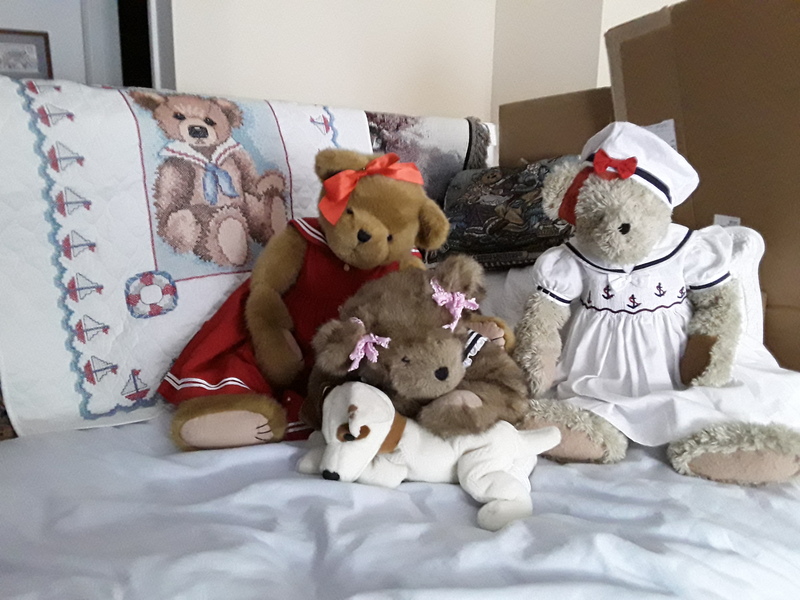 We teddys are not permitted to have them because we are a lot younger than the hitty dolls and a lot nore irresponsible and careless. Not fair,!! 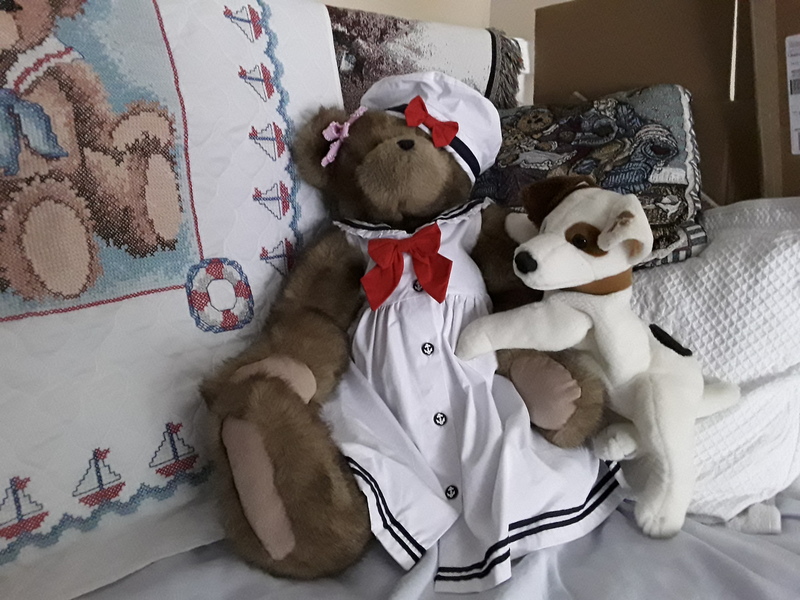 Me and becky bear looking very cute! 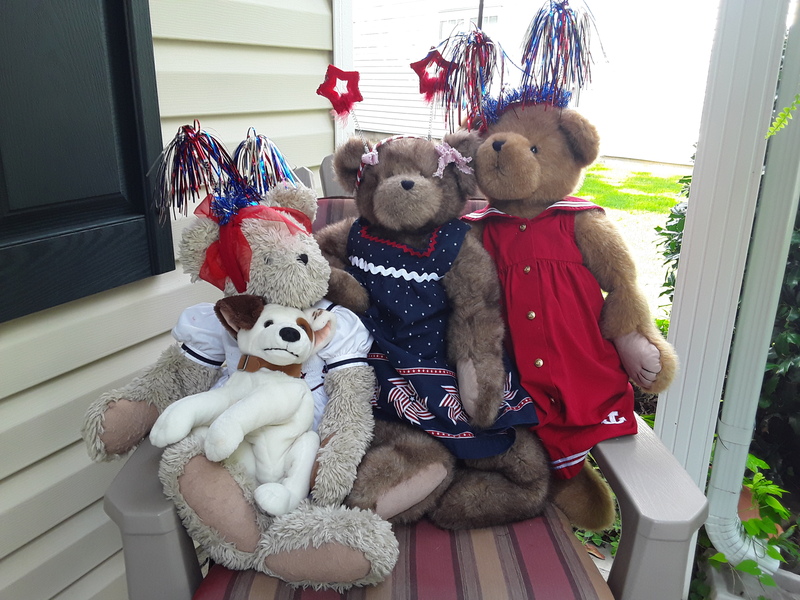 And here is a puc of us looking even cuter wearing our 4th of july head bands with built in ” fake fireworks”. presents. 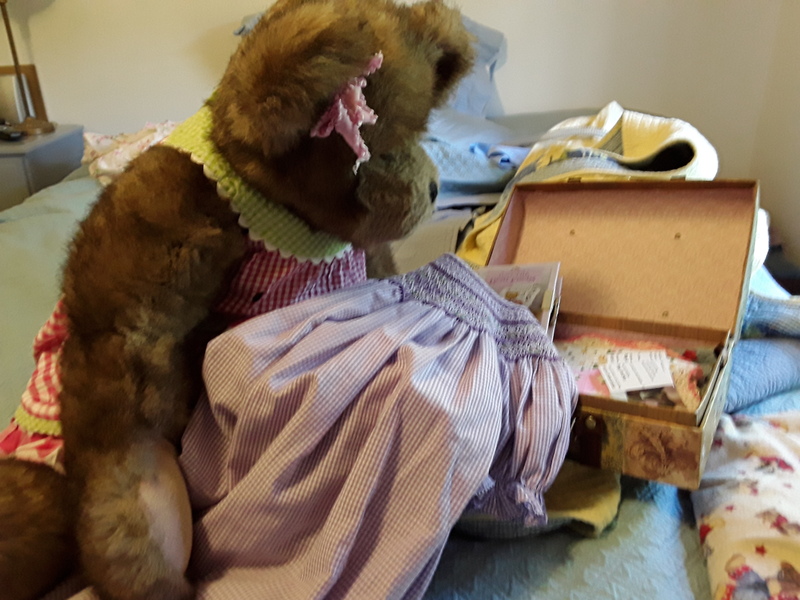 And if mama feels well enough i will help her get the hitty dolls dressed and arranged. “PLAYING” is not only good for a person physically but also good for the soul. 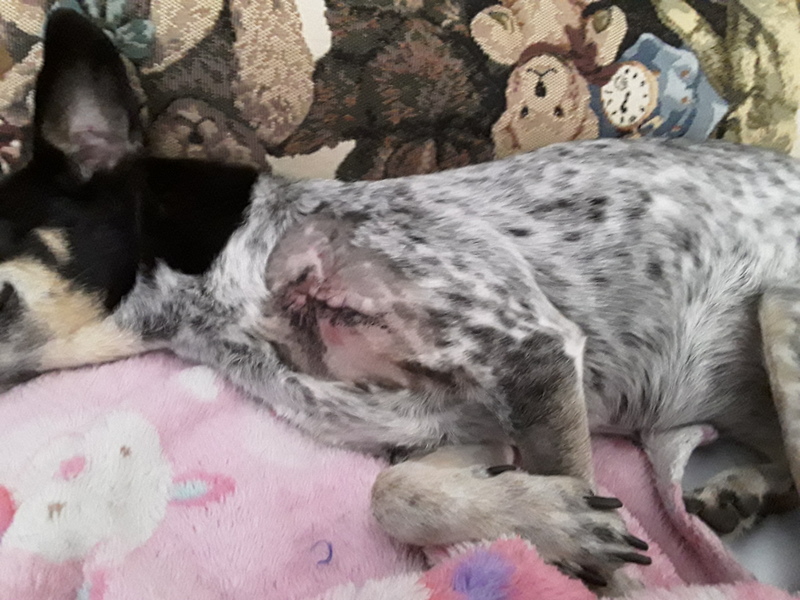 Molly is doing a lot better but she is still resting more than usual. Which is fine with me. Mama had a worse than usual weekend as far as wellness goes so her and I rested up also. 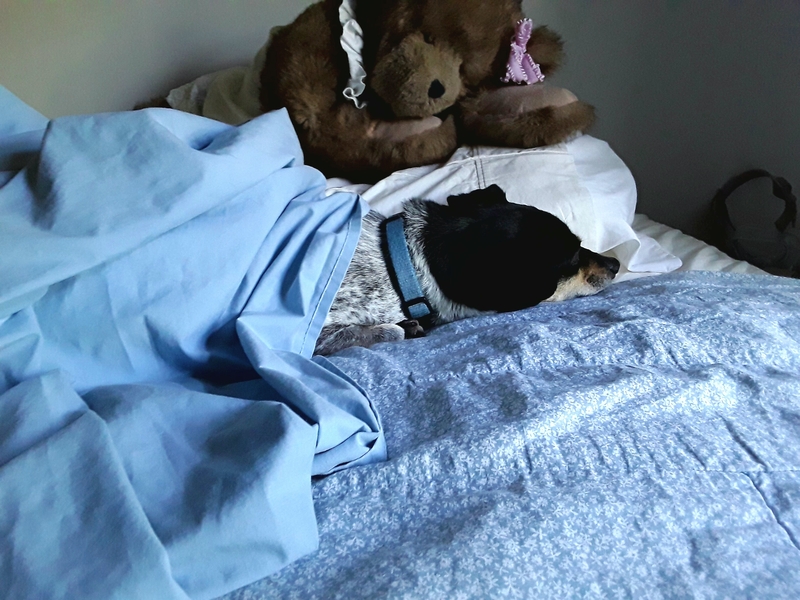 Molly the dog gets comfortable. 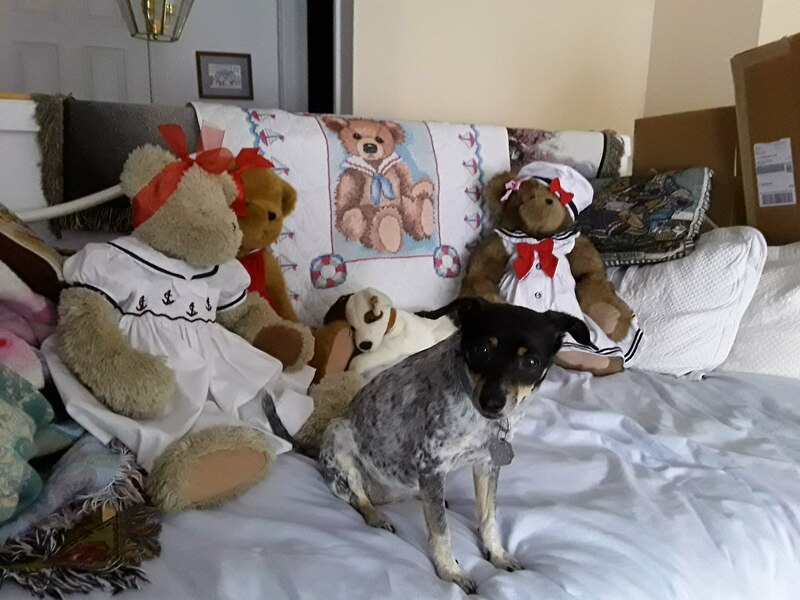 Molly the dog thinks all pillows should be shaped like teddy Bears! Mama Mary is from “up north” originally and is very old fashioned. 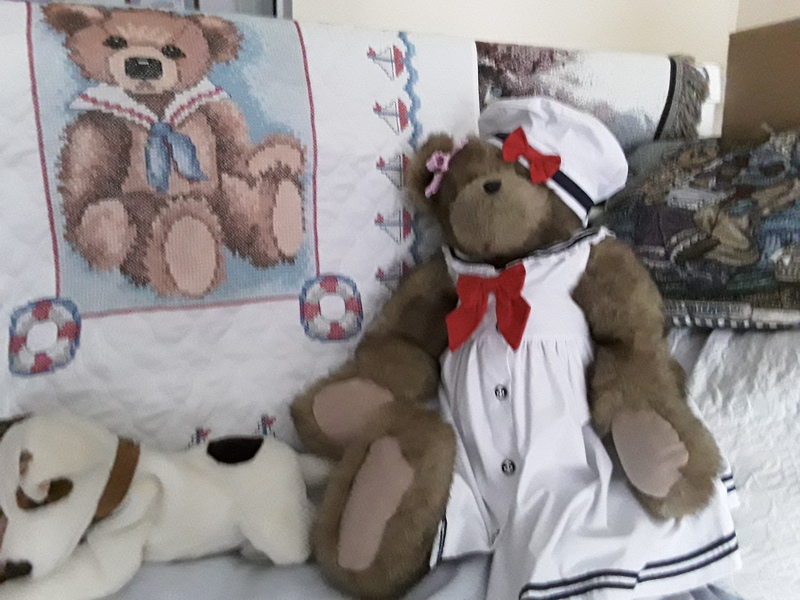 She insists that you do not wear white or linen until after memorial day and you put your whites and linens away after labor day. This really dates her and some of you can guess her advanced Age! 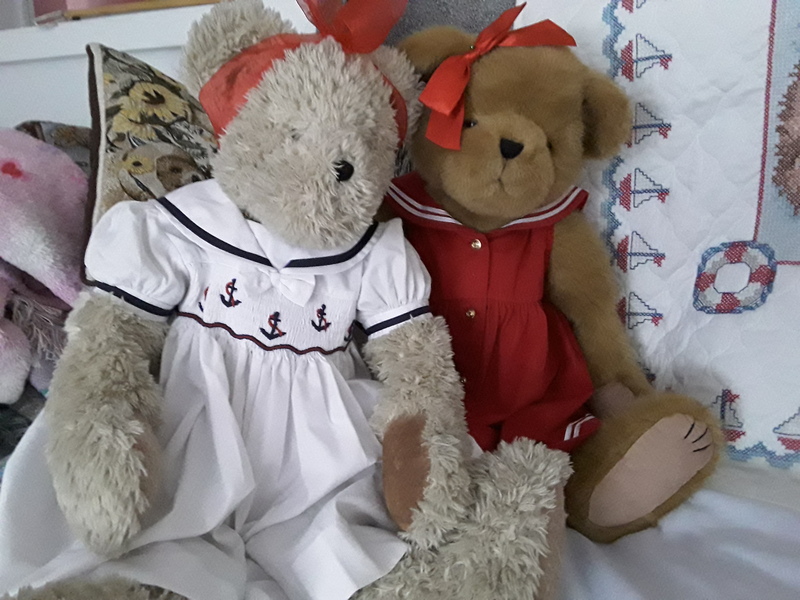 So last week before Molly had her surgery she dressed me and 2 of my good friends becky bear and betsy bear in our sailor dresses. She was not satisfied with the pics and may do a “do over” outdoors. Believe it was from a stamped cross stitch baby quilt kit. Mama likes to do stamped cross stitch but had never seen this kit before finished or unfinished. It was beautifully crafted and she got what she calls ” a good “price”, another one of her favorite things. Molly the dog is bouncing back miraculously from her surgery. Too bad people do not heal as fast. We are having a hard time restraining her. She is a very active dig even at the age of 12. Mama calls her “my circus dog” because she never walks when she can run, takes the stairs 3 at a time and jumps over beds, you go girl!! Are in a “wait and see” mode waiting for the biopsy report. She had a really tough day yesterday and was in considerable pain last night. To restrict her movements she had to sleep in her crate last night with the door closed, something that never happens. She slept pretty good and this morning she ate a little and even went outdoors to tinkle. She has always bounced back very quickly t from these tumor removals but her age is 12 years old now. 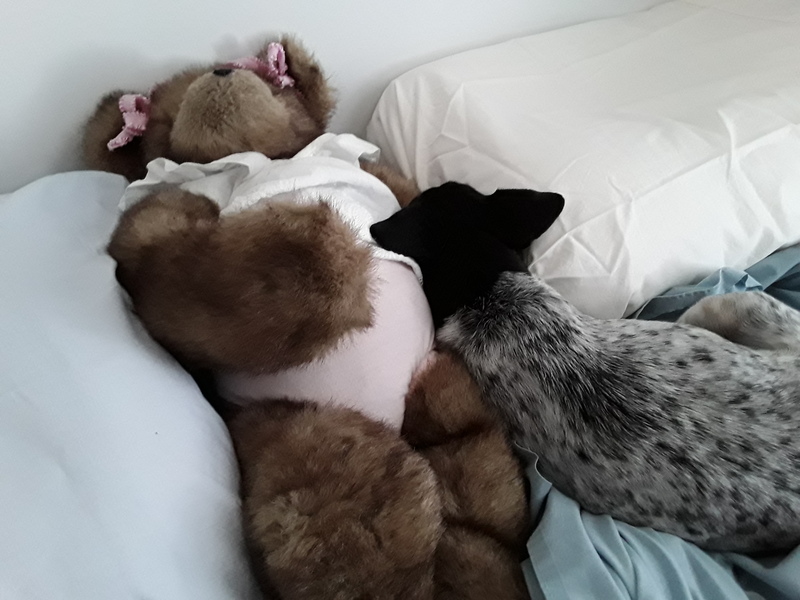 However she is resting peacefully and does not seem to be in a lot of pain this morning, mama Mary slept very poorly last night and I like to think I was a great comfort to her choosing to sleep with her instead of Molly since Molly needed a good rest. And I did not want to crowd her in her crate. I will keep you posted on her recovery. She is a real VIP in this house and it is distressing to see her like this. Her doctor thinks it went quite well.